I first learned about Urban Sketchers over a year ago after spotting some beautiful cards at La Tienda in Ballard, thinking that they looked like the work of my old grad school classmate and colleague, Gail Wong. Sure enough, they were, we reconnected after several years, and she invited me to come sketching. I finally did just over a year ago at the Ballard Locks. A few months later I was invited to be a correspondent, and am finally getting around to it. I wanted to join in part to get my sketching chops back in anticipation of applying for a Northwest Institute fellowship in Italy. I was fortunate enough to receive it, and am currently enjoying their facilities in Civita di Bagnoregio, following on the heels of Stephanie Bower and soon to be joined by Anita Lehmann. 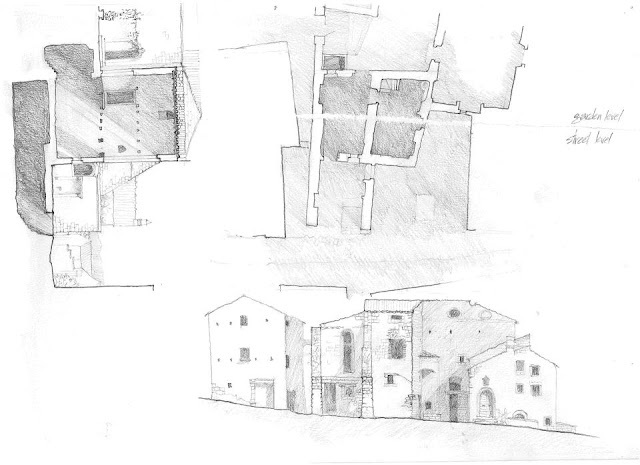 I can't pretend to match their skill, but will be posting my sketches from Civita over the remaining six weeks of my fellowship, both here and with more about Civita on my project blog. The seed of my proposal was this sketch I did of one of the institute's properties as a student in here in 1984.